Capcom has been knocking out of the park recently, starting with the release of Monter Hunter: World, the Japanese developer/publisher has had a consistent string of great releases. Kicking off 2019, Resident Evil 2 released in January to critical acclaim. 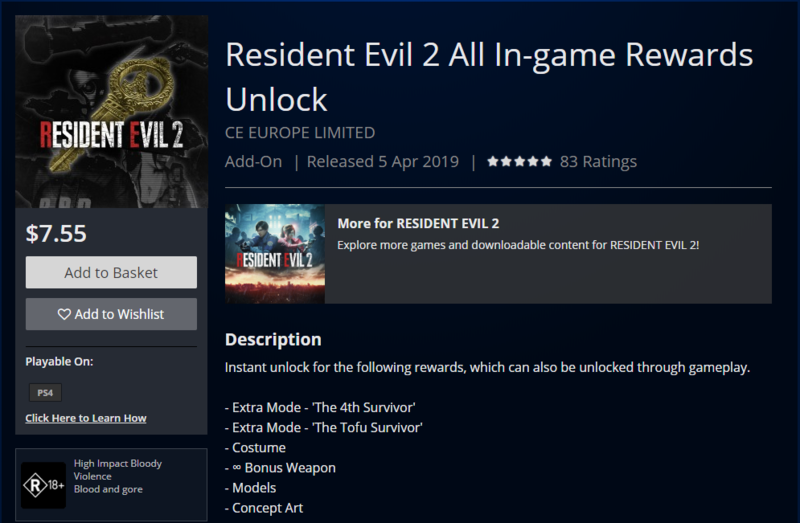 Flying under the radar, Capcom has implemented a microtransaction which unlocks every in-game reward in the aforementioned Resident Evil 2. For the price of $7.55 ($7.95 for Xbox players) players of the REmake can pay to unlock all the different rewards that are available in the game including the two extra modes: The 4th Survivor and The Tofu Survivor. Resident Evil 2 is a remake of the original classic survival horror game. In addition to the HD treatment the game received from being rebuilt in the RE Engine (the same engine that powers Resident Evil 7 and Devil May Cry 5), the general gameplay and camera were shifted to modernise the game. Our very own Zach Jackson reviewed the game favourably, stating “this is everything that I wanted from an RE2 remake and then some.” If you would like to read the review, click here. Capcom Leon is bae microtransactions Pay-to-play-less-of-the-game Resident Evil 2 why does it cos more on xbox?